Golf - Bearcat Foundation Inc.
Another successful Homecoming Parade and this year the MHS student body ended the parade with a bonfire & car bashing!! Arkansas 4A State Runner Up. Beautiful Day on the course. Came in behind Valley View on their home course. Great job, boys! We are so very proud of you all. 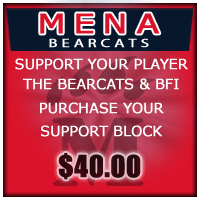 BFI is taking per-orders for fall volleyball and football merchandise. Only available through pre-orders and must be pre-paid. Visit BFI Facebook or Instagram for full pictures, pricing and payment options. Deadline August 15th. 2018 BFI membership drive is in full force and the new brochure is available to download now! Join now to help support the 2018-2019 MHS and MMS athletes and help provide them with the the tools to be successful.